My sister received a beautiful bouquet of flowers for her last birthday which included deep red roses. After a week, they had fully bloomed and just started to wilt. Instead of throwing them into the compost I decided to grab the rosebuds with the intention doing either a refreshing rose water spritz, lotion or just dry them and infuse some jojoba oil with them. 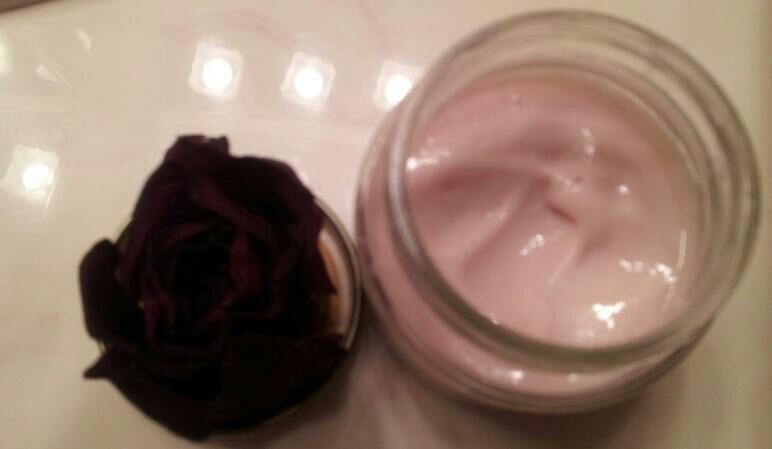 I finally decided on lotion so first I made a very strong ‘tea’ with the petals. This tea made up 100% of the liquid portion of this lotion – for natural colour and fragrance. Luxurious organic jojoba and avocado oils together with unrefined cocoa butter and a ‘silky’ emulsifying wax makes this the.best.lotion I have made so far. It sinks into the skin in less than a minute of application leaving behind skin that FEELS and looks intensley hydrated with no residue on the skin.